PSB Speakers is a household name. The head honcho, Paul Barton, really wanted to recreate the same PSB sound that we all know and love, and put that tech into something a little more portable. Enter the PSB M4U 8s, which feature some fascinating new ideas. This is our first time testing out something from their wireless headphone line, and in this review, we break down the M4U 8s sound, design, comfort and fit, packaging and accessories, specs and more. If you'd like additional options, see our list of the best wireless headphones. PSB designed the M4U 8s with stereo speakers in mind. So, it comes as no surprise that the soundstage is pretty wide. Every aspect of the mix is separated, sitting in its own section. We have no complaints of muddiness or lost frequencies, which is impressive in itself. The built-in RoomFeel feature, which is noticeable in all active listening modes, does a bang-up job of making you feel like you’re in the center of the mix, listening to tunes on your speakers. This was designed specifically by PSB head, Paul Barton, and we think he nailed it! This aspect of the headphones is probably the most impressive, which make these the perfect cans for anyone familiar with PSB’s sound. They’re known for their wide, immersive soundstage - which comes across well in these headphones. The headphones don’t add any special colorization to the music - which can be, arguably, a pro or a con - but it’s easy to get lost in the sound. After wearing them for awhile, you find yourself drifting in and out of reality, as if unaware that the sound source is directly on your head. This feature alone makes the headphones perfect for daily listening - especially if you’re planning on wearing them at work, on the go, or just around the house while you do chores. And the M4U 8s do a solid job at replicating tracks accurately: you’re certainly not putting them on purposefully to immerse yourself in rich, succulent sound, as with the Audeze LCD2Cs (full review here). Neutrality isn’t necessarily a bad thing, but it does mean that they don’t stand out amongst the crowd. Like getting lost in the mix, these headphones could get lost in a pile of other sub $500 gadgets. However, if you’re a fan of neutrality, you’ll definitely prefer these over some of the other wireless headphones on our list. If there’s one viable sound complaint about the M4U 8s, it would be that the highs are a touch too bright at loud volumes, but it must be said that you have to push them pretty hard to get to this point. Though this makes them fantastic for movie watching and picking out dialogue, it can be a bit overbearing with genres that use a lot of treble heavy instruments. Cymbals, fiddle, and effects get a slight boost, which can cause some listening fatigue after a bit of use. Though you may not notice this while wearing the headphones, you’ll feel some sensitivity after taking them off. The lows can get pretty powerful, depending on the genre you’re listening too, but they aren’t overwhelming or distracting. The Active Noise-Canceling (ANC), though marketed as their main selling feature alongside RoomFeel, isn’t necessarily a huge factor in their usability. If anything, the noise isolation - without ANC enabled - does a decent enough job on its own. There wasn’t a noticeable difference with ANC activated - they certainly don’t achieve complete isolation like the Bose Quietcomfort 35 IIs (full review coming soon) claim to have, but they manage to block out most environmental distractions. If you wish to hear the outside world for a moment, simply double-click the volume switch, and you’ll experience the M4U 8s ‘Transparency Mode.’ This mode uses the ANC’s built-in microphones to enhance exterior noise. It’s a little startling at first if you aren’t prepared for how much it enhances sounds, but definitely a neat feature to have. The PSB M4U 8s reminded us of a luxury Prius. Trust us, this metaphor will make sense in a second. When held in the hand, the headphones definitely have some weight, which is a welcome design quality here. They’re also built well: nothing about them feels loose or fragile. Even the little switches for volume control, the passive and active playback options, and the Bluetooth button feel like they could take a beating. In fact, you could probably beat someone down with these cans. Wait until you get a pair in your hand - you’ll see what we mean. In comparison to other models, like the Sony WH-1000XM2s, the M4U 8s are the Hulk, and the Sonys are Loki. We probably don’t need to remind you how that interaction went the first time. The design, though a little old school, is simple and functional, with zero flash. The band and ear cups are made of a synthetic leather, with memory foam cushioning. The cups are highlight of the design, and almost enough to distract you from the rest. Almost. Because what on earth was PSB thinking when they chose to mix this many materials on one piece of gear? It’s as if they didn’t know which option to go with, so they chose them all. We’re not sure if these headphones even know what they’re supposed to be. Leather, metal, plastic, rubber, matte, glossy? Take your pick. They’re all here. The M4U 8s may be well built and sturdy, but they are anything but elegant - a word we’ve used to describe the Bowers & Wilkins P7s (full review here). Now those are some fine-looking cans. They may be a little old, but design-wise, they beat the M4U 8s into the ground. Perhaps the most bothersome part of the headphone design is the rubberized casing on the lower half of the unit. It wraps around the earcups in a way that makes it absolutely impossible not to touch when hunting for the controls. And man, does it feel gross. This is what ultimately awards them the ‘Luxury Prius’ status: you’ve paid a pretty penny for a plastic vessel with leather seats and rubber mats. There’s much better news when it comes to functionality. PSB really wanted to cover all their bases, to make sure that you could use the M4U 8s in any environment. 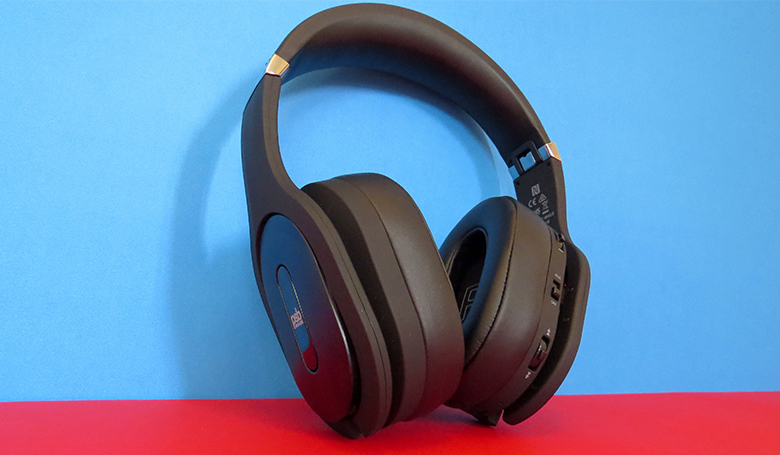 Not only are these headphones wireless using aptX Bluetooth, but they work with analog connectivity via Aux, and digital connection via micro-USB. All of which work pretty damn well, and make up for our issues with the aesthetics. If you’re confused about any of these words, just read our buying advice for wireless headphones. We had no connectivity issues using Bluetooth - a breath of fresh air after some of the nonsense we’ve dealt with lately - and could even leave our playback source in another room, with absolutely no glitches. Testing this to the max, we went as far as to walk across the apartment, around the corner, into the bathroom, and climb into our bathtub before we noticed any blips in noise. See what we go through to bring you great reviews? The battery life is solid, rated at fifteen hours. Not quite as good as Plantronics’ BackBeat PRO 2, rated for 24 hours. But, fear not. If you manage to exhaust the rechargeable batteries on the go, you can actually swap them for standard AAA alkaline batteries. The headphones even have a built-in safety feature to protect them from any power surges/failures if you accidentally plug them in to charge without swapping back. We’ve gotta hand it to PSB for this one. Slow clap. Like a round of tag, we keep jumping back and forth between things we like, and things we don’t. After talking up the stellar connectivity in the M4U 8s, which more than made up for their design flaws, it’s a real shame to have to bring up another issue: the clamping pressure. These headphones are tight. Not tight, as in “That’s tight, man!” Tight as in, “I ate way too much pasta and now my pants don’t fit.” This, unfortunately, made it tough to enjoy the headphones for more than an hour at a time - and that’s being generous. It’s unfortunate because these headphones had the opportunity to be so great. But not everyone can nail comfort like Beyerdynamic and their Amiron Homes (full review here). Breaking the fourth wall for a second here: I, Alyssa, have a fat head. Hundreds of years of Finnish inbreeding has left me with a face wider than a dinner plate, and I sometimes struggle to get a good fit with my over-ears. The cups were also a tad small for my ears, and they felt a little cramped. I don’t shame PSB for not making these headphones with my big head in mind, and maybe a few stress tests would loosen the band a bit if I weren’t worried about damaging the loaner model. And it’s worth noting that TMS Editor Rob did not have this fit problem, but some other listeners have made similar complaints to myself. We suggest testing these first, if possible, to make sure the fit is right for you before making the commitment. As mentioned previously, the band and cups are made of synthetic leather, with memory foam cushioning. If the headphones fit properly, these are actually pretty comfortable. Not quite floating-on-a-cloud comfortable, but decent enough to have them on your head for quite some time. Much like our favorite on-ears: the Master & Dynamic MW50s (full review here). Due to their smaller size, these headphones tested great for movie watching - you can really lean back into the couch - and weren’t too intrusive of everyday tasks. PSB did not disappoint in the way of accessories. Along with the headphones, the M4U 8s come with a semi-hard, clamshell carrying case, a 3.5mm Aux cable, a micro-USB cable, a ¼” to 3.5mm adapter, extra memory foam pads, a carabiner and cleaning cloth, and an airplane adaptor. Yes, an airplane adaptor. Does anyone ever actually need an airplane adaptor? We’ve seen them on some Asian airlines, but are pretty sure every airplane in the western world has stuck with the standard 3.5mm jack. Nevertheless, PSB covered all their bases. The carrying case is a nice feature, though a bit clunky. If you have a larger laptop bag or backpack, the case functions well as protection from smashing about with the rest of your stuff. Conveniently, the rest of the accessories also fit within the case. The box is solid, though we don’t think you’ll be keeping it around for watch storage like you would with the Shinola Canfield In Ears (full review here). It looks like a typical, mid-to-high quality headphones package, with all the standard information and PSB colors. Nothing more, nothing less. What’s interesting about the packaging itself is the way the accessories are housed within the box. When you open it up, you’ll see little diagrams and arrows pointing to hidden accessories, tucked underneath the cardboard inserts within the box. It’s like a neat little accessory Easter egg hunt. The M4U 8s offer multiple playback options. They are built well, and have weight to them. There are a decent amount accessories provided. The M4U 8s portray accurate, neutral sound. They have a long battery life with additional battery options. We didn’t notice a huge difference with ANC. The headphones feel a tad plasticky. The clamping pressure is a little too snug, but results may vary. Our beloved. Tried and true - Bowers & Wilkins PXs are our first alternative to the PSB M4U 8s. If we could, we would compare every pair of headphones to these, and their predecessor - the B&W P7s. Until they get absolutely smashed by competitors, these headphones will always exist in our wireless headphones roundup. They sound good, the battery life is better, and they look so much cleaner than the M4U 8s. No, looks aren’t everything, but they do matter to us - clearly. You’re going to be wearing these on your head, after-all. No one wants to walk around with a bad haircut, right? The fact that the B&W PXs cost the same as the M4U 8s is questionable, but to each their own! Next, we have the Sony WH-1000XM2s - OK, seriously, guys, easy on the name, this isn’t Transformers. They won first place in our wireless headphones roundup. Therefore, they deserve to be an alternative recommendation. With thirty hours of battery life, stellar noise-cancelation, and lightweight build, these cans beat the M4U 8s in terms of usability. They’re also balanced aesthetically, which make them a better option for someone looking for a streetwear-friendly design. However, we’re pretty sure that, if you put the two in a cage match, the M4U 8s would Hulk Smash the bejesus out of these. It’s tough to find a better alternative at this price point - $298 to PSB’s $399 - if you’re willing to sacrifice durability. Another one of contenders in the wireless headphones roundup, the BeoPlay H9is are a solid comparison to the M4U 8s. No, their noise-cancelation feature - called Transparency Mode - isn’t perfect, but they do come out on top in some other ways. The BeoPlay H9is are a bit more expensive - at $479 - but those extra dollars go straight to design. These headphones are attractive. They’re something you actually want to put on your head. They don’t have aptX Bluetooth, but the level of comfort and wearability of these things is worth the give. If you’re into PSB’s sound and want some other alternatives, you can certainly check out options within their headphone line. For instance, their wireless earbuds: the M4U TW1s. No, they won’t offer the same RoomFeel or ANC that the M4U 8s do, but they are convenient for on the go, and wallet-friendly at $149. They make a perfect alternative to AirPods, while offering PSB’s signature quality and sound. All without the hassle of clamping pressure? Sign us up.